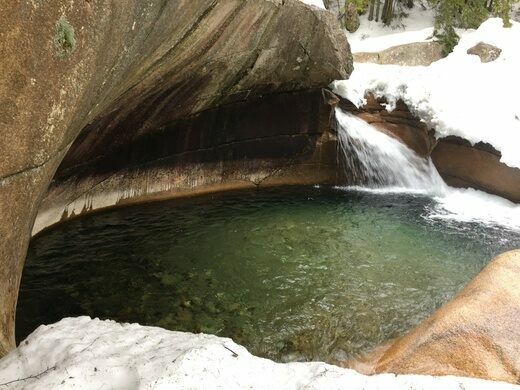 Even Henry David Thoreau found this glacial pothole irresistible. 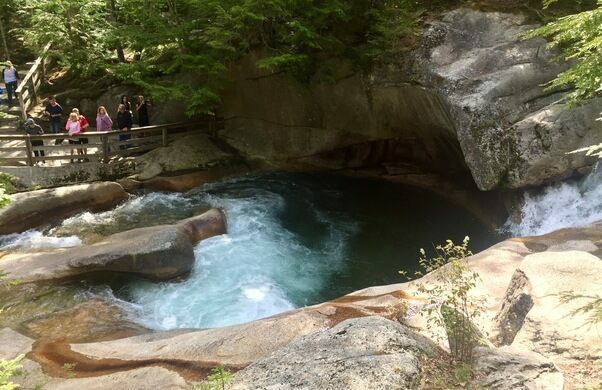 In the centuries since Westerners have bothered jotting it down on maps, New Hampshire’s “The Basin” is without a doubt the most divine pothole to ever be blessed by literary and naturalist heroes. Come for the gun-toting hillbilly madman, stay for the ice-cream loving basketball bears. What if we could make dribble castles out of ice? In Lincoln, New Hampshire they can. Centuries worth of explorers have meandered through New England’s White Mountains, delighted by waterfalls large and small wending their way through picturesque deciduous forests. 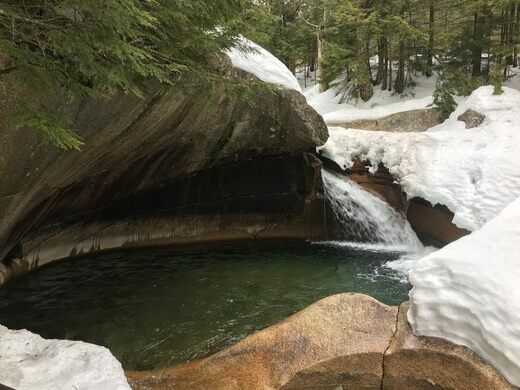 Yet among the myriad cataracts formed by the Pemigewasset River, even just within Franconia Notch State Park, one glistening feature sets itself apart from the rest. 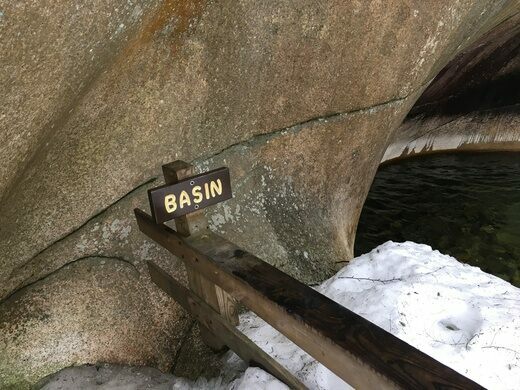 The Basin, a 30-foot-wide, 15-foot-deep bowl hewn from a torrent of rushing water pouring down the face of a granite cliffs, is a geological masterpiece. Dating back to the Ice Age when a pebble, carried in a stream bed, was trapped in a fissure of igneous rock, The Basin has swirled and churned into its current form. As thunderous, icy blue waters pour into its bowl, the gentle curves of the surrounding rocks rise and fall like great dunes frozen in time. There’s something about the site that is mesmerizing. It has been so for generations. The waterfall pothole is there, right now, raging away, awaiting goddesses. Parking is accessible in both directions via exit 34A off I-93. A gentle, paved hike leads from the parking lot to The Basin itself. Dog friendly.There are 2 viewing areas. One is handicap accessible. The walk to the basin is less than 10 minutes and there is a parking area. Packed with gear and memorabilia, this museum chronicles the history of skiing and how its rise shaped New England. The bright red stripes streaking across the rocks are the star feature at this Icelandic waterfall. This natural wonderland is a unique chance to explore a Carolina bay, a mysterious geological formation of unknown origin.